It’s Day 12 of Blogmas! 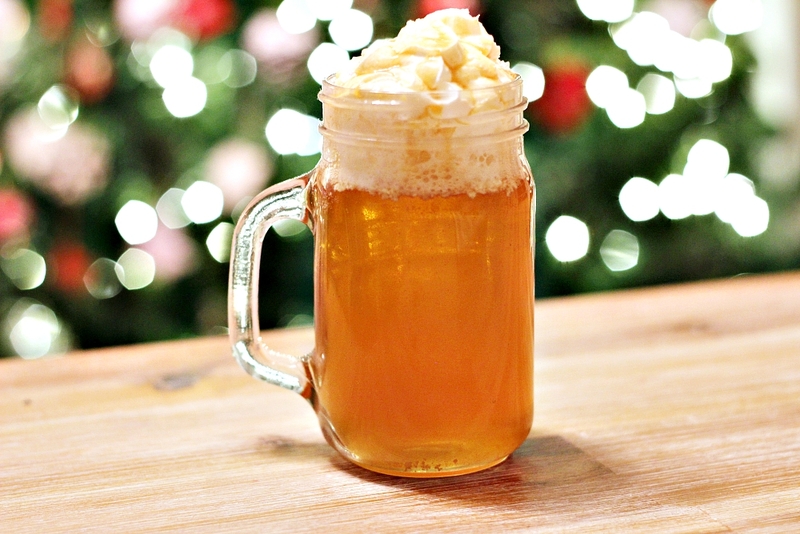 Today’s post is a recipe for the most delicious warm, caramel apple cider. It’s alcohol free so everyone in the family can enjoy it, and it’s perfect for cold, winter nights or as a deliciously sweet alternative to mulled wine. It’s also super quick and easy to make, which is my kind of recipe! Pour the apple juice and caramel syrup into a small pan, stir well and heat over a low heat until hot – about 5 mins. Try not to let it boil. Remove from the heat and add a tiny pinch of cinnamon and stir well. Top with squirty cream and drizzle caramel sauce on top, and enjoy! The 300ml of apple juice is based on this Kilner glass jar mug, which allows about an inch of space at the top for the cream. I’d suggest measuring out the apple juice in your own mugs and using this to measure your apple juice quantity, and adjusting the amount of syrup as needed. The recipe ingredients are listed to make one drink; to make a larger batch, simply multiply the ingredients for the amount of people you’d like to make it for and you’ll need to heat it for longer. If you want to serve this at a party or gathering, you can make a large batch and then keep it hot by putting it in slow cooker on the warm setting, using a ladle to pour it into glasses as needed. The caramel sauce I used is Clarkes caramel Sauce. The syrup is Vedrenne caramel syrup or I also use Jordan’s caramel sugar free Skinny Syrup if I want to cut down on the sugar. You can also get Monin caramel syrup which are the syrups Costa coffee use. You can add more cinnamon for a stronger flavour if you’re a cinnamon lover. I only add a very tiny amount just to reduce some of the sweetness, as the apple juice and caramel syrup are both very sweet.